AMSTERDAM, Netherlands (CNN) -- Dutch authorities will file charges against a lawmaker for inciting religious hatred in speeches and a film he made about Islam last year, an Amsterdam district prosecutor told CNN Wednesday. 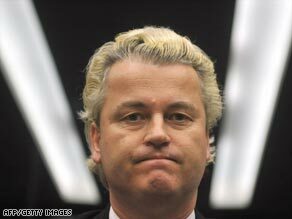 Geert Wilders is a member of parliament for the right-wing Party for Freedom. Prosecutors had originally decided not to press charges against Geert Wilders, 43, a member of parliament for the right-wing Party for Freedom. "We thought a conviction would not be possible," prosecutor Otto Van Der Bijl told CNN. But nine people filed complaints with the Court of Appeal, he said. The court found there was a "reasonable suspicion that Mr. Wilders is guilty of the charges and the prosecution should in fact proceed." Wilders blasted the court decision as "an all-out assault on freedom of speech," in a statement posted on his party's Web site. "Apparently this is the Netherlands today. If you speak out you might be prosecuted. To participate in public debate has become a dangerous activity," he said in the statement, which also called for donations to the party to help him fight the charges in court. The charges stem partly from a 15-minute film Wilders released online last March, "Fitna," which features disturbing images of terrorist acts superimposed over verses from the Quran to paint Islam as a threat to Western society. The movie drew complaints from the European Union and the Organization of the Islamic Conference, as well as concern from the United States, which warned it could spark riots. The film opens with a controversial caricature of the Prophet Mohammed wearing a turban shaped like a bomb, followed by translated portions of Islam's holy book, the Quran. The passages are interspersed with graphic images of the September 11, 2001, terrorist attacks against the United States juxtaposed with audio from 9-1-1 calls made by the victims trapped inside the World Trade Center in New York. The video includes images of other terror attacks; bloodied victims; beheadings of hostages; executions of women in hijab, the traditional full-body covering; and footage, with subtitles, of Islamic leaders preaching inflammatory sermons against Jews and Christians. The film concludes with scrolling messages reading in part: "The government insists that you respect Islam, but Islam has no respect for you" and "In 1945, Nazism was defeated in Europe. In 1989, communism was defeated in Europe. Now the Islamic ideology has to be defeated." Wilders has been outspoken in his criticism of Islam and called the religion a threat to the world. "It's not a provocation, but the harsh reality and a political conclusion," Wilders said of the film when it was released last year. The title "Fitna," is Arabic for "strife" or "conflict" of the type that occurs within families or any other homogenous group. In deciding that Wilders should face charges, the Court of Appeal did not rule on the lawmaker's guilt or innocence, prosecutor Van Der Bijl said. "The prosecutor's office is now working on an indictment," he said, adding that it could take months to complete. Van Der Bijl said he did not expect Wilders to be arrested before he comes to trial. The charges are "insulting groups of people" and "inciting hatred against people of a certain faith," related to his film and speeches, the prosecutor said. Five years ago, Dutch director Theo van Gogh was stabbed to death by a member of a radical Islamic group after his short film "Submission" used verses from the Koran written on women's bodies to criticize the treatment of women in Islamic cultures. His co-producer on the project, Somali-born former Dutch lawmaker Ayaan Hirsi Ali, lived under government protection for several years after van Gogh's killing. She now lives in the United States. -- CNN's Ben Blake in London contributed to this report.